"I can't believe the year has passed so quickly. It's a little scary to tell you the truth. The organization is great, has great benefits, and really wonderful people working for them. I really consider myself lucky to have landed this job. I have traveled twice for work this year, and I might be going to Hong Kong in the winter." Nicholas Lembo (MA Anth/ID 2009) works at the US-India Business Council, a wing of the Chamber of Commerce, where he handles business intelligence research and run our programming calendar. In addition, Nicholas's personal blog Zzzeitgeist can be accessed at http://zzzeitgeist.blogspot.com/ According to the site description, this is a blog that "seeks to identify, explain, and link the many disparate strands of international politics and economics. How does China’s internet firewall affect its trade obligations? What's the best way to regulate international credit markets? Do mosquito nets really promote development? How can the international community address climate change without disrupting global commerce? And, most importantly, why does all of this matter?" Emma Parkerson (BA Anth and Psychology 2009) has a new position with the National Board for Teaching Standards (NBPTS). "She reports: "[NBPTS's] mission is to maintain rigorous standards and provide a voluntary certification system for what accomplished teachers know and do. I work in the Standards, Assessment, Operations, and Research Department to organize committees for continued revision of the standards. It is a very interesting time to be a part of the education community, that's for sure! "I'm glad to report that I find myself accessing my anthropological knowledge each day, especially since we just completed the revision of our Social Studies-History and English as a New Language standards! I am thankful to have a strong foundational knowledge of culture, language, and human interaction and hope that it continues to help me move toward a more international- and policy-focused career in education." Congratulations to Nadia Rahman (MA Anth/ID 2008) on her continued studies at Oxford University and recent marriage. Regarding her studies, she reports "This will be my second year! I'm doing my D.Phil in (medical) anthropology [my research topic is still in the making, will send you more details once I have it all tweeked!]" As for her recent marriage, she says "Josh Connelly and I did our civil ceremony here in the States this summer. Nothing fancy. No family and friends present...I'm planning on having my wedding ceremony next summer, July 2010. The wedding will be in Dhaka, Bangladesh. I expect to see many friendly and familiar GW anthro faces!" Congratulations to Katie Reid (BA Arch and Art History 2009) on her new position as Lead Recreation Aide with Spectrum for Living, an organization which works with developmentally and physically disabled adults. She says "I love working with this population! I also get to use my ASL knowledge since there's several adults who are deaf and disabled." Katie will be leaving her current job to attend the Museum Professions MA Program at Seton Hall University, New Jersey. "Living in DC and going to school at GW has given me the knowledge and experience that I need to be successful at Seton Hall University's Museum Professions Masters Program. I made valuable connections with professors and fellow Museum employees at museums such as the NGA and Alexandria Archaeology Museum. I am looking forward to beginning the next chapter of my academic career as a grad student and fulfilling a dream of working at a museum." Barbara Miller, Professor of Anthropology & International Affairs and Associate Dean for Faculty in the Elliott School, launched her new blog, AnthropologyWorks, this week. It is devoted to promoting anthropological knowledge about important world issues and making connections within and beyond anthropology. Babs is also using Twitter to promote discussion on issues of anthropology. Alison Maassen (BA Anth and IAFF 2009) is living at Isla Mujeres, about eight miles off the coast of Cancun, teaching English in a low-income majority Maya community this year. "As the island is a popular tourist destination, the ability to speak English is a huge economic advantage for the community. "As for plans beyond this year, I wish to refocus my studies in public health/medical anthropology, and will eventually be going to grad school for a Masters in Public Health... if anyone is coming down to the Mayan Riviera in the next year, feel free to contact me!" Teresa Uczekaj (BS Bio Anth 2009) recently returned from a five-week posting at the Asha Kirana Hospital in Mysore, India. "[The work] was coordinated through a non-profit organization called Pro World Service Corps, the same organization I worked with in Mexico when I led International Alternative Spring Break at GW. "While I was there I worked on two main projects and several little ones every day. One of the main projects was to collect baseline data on anemia and the progression of HIV/AIDS using in-patient records, and for the other I was asked to write a case study on the challenges facing women living with HIV/AIDS in India. Smaller projects included daily health related activities, demonstrations, and skits for the patients. "It was an incredible experience on so many levels and I got to meet a lot of extraordinary people!" Adam Prins (BA Anth and Arch 2009) is at Cairo's Egyptian Museum working to update their database and cataloging system. This position comes subsequent to his employment at an archaeological excavation in Cyprus earlier this summer, where he worked to create digital maps for future publications of the project's findings. "In January I will be traveling to the Dakhleh Oasis in Egypt to dig at a Roman city called Amheida (known in the ancient world as Trimithis). All the while, I'll be applying to graduate school and hopefully starting my Master's degree next fall." "Staging the Self: Examinations of Performance and the Construction of Identity" hosted by the National Association of Student Anthropologists. The panel will take place on Wednesday, December 2 in Philadelphia. "Both Phil and I are very excited because it's our first presentation at the AAA's. Also, both of our papers are based on research done at GW, supervised by Alex Dent. My paper is titled: "From the Larynx to La Traviata: Ideologies of Science and Construction of Voice in Bel Canto Pedagogy", which is based on my undergraduate thesis research. Phil's paper is titled: "Going to see a man about a Horse: Examining Masculinity in Public Space in Restrooms", which is based on research done for his Master's thesis here at GW." Hominid Paleobiology Ph.D candidate Erin Marie Williams was featured on NPR for her work as part of a team of researchers exhuming the remains of gorillas in Rwanda descended from those studied by Diane Fossey. Williams sent a series of dispatches during her work in the field, the full texts of which can be read in the NPR article "Why Dig Up Mountain Gorillas?" Although her focus is mainly on the evolution of the human hand and wrist, Erin Marie has now turned her attention to tracking and recording the history of these Rwandan mountain gorillas. Before entering the Hominid Paleobiology program, Erin Marie received a GW M.A. in Anthropology (2005). Barbara Miller, Professor of Anthropology & International Affairs and Associate Dean for Faculty in the Elliott School, was the guest editor of a special edition of the journal Heritage Management that was published in spring 2009. The theme of the issue is "Heritage Management Inside Out and Upside Down." It includes three articles by cultural anthropologists, by an archaeologist, and an introduction by Miller entitled "Heritage Management Inside Out and Upside Down: Questioning Top-Down and Outsider Approaches." The papers were originally presented on a panel Miller organized at the 2007 annual meeting of the American Anthropological Association. Robert Shepherd, Assistant Professor in the University Honors Program and the Department of Anthropology, published an article entitled, "Cultural Heritage, UNESCO, and the Chinese State" in the spring 2009 issue of Heritage Management. In the past two decades, the government of the People's Republic of China has become a strong supporter of UNESCO material culture preservation efforts within China, including ethnic minority areas such as the Tibet Autonomous Region (TAR). This article uses a range of materials including fieldwork findings, museum research, and anthropological studies of ethnicity and development in China to examine this shift in state policy from the "modernization" of minority peoples through state-directed development to cultural preservation. Major findings are that these policies serve development in a different way, by supporting political claims to regions such as Tibet through the promotion of historical and cultural ties between China and Tibet, and by fostering a rapidly expanding domestic tourism industry in minority regions. Joanne Brucker (BA Anthropology 2007), graduated from Harvard University in June with an MA in International Educational Policy. She is currently involved in a wide variety of activities. Along with some colleagues from Harvard, she is finishing up a project with UNICEF on inclusive education; they are writing a report for the CEE/CIS region about all the children left out of school, and she is writing the section on Roma-inclusive education in Macedonia. This summer she completed a project for SIT on their youth programs. In this role, she was part of the summer Governor's Institute Staff working on current Issues and Youth Activism. One of the programs involved a group from Iraq who came on a State Department program joint with a group of Americans. Most exciting of all for her was the final program: a joint project with Danish People's Aid and the U.S. Embassy in Denmark which brought a group of multicultural Danes to SIT for two weeks of intense leadership and active citizenship training. The program was especially rewarding and challenging for her because of her cultural background. She is also involved with another group of Harvard students working on a moral-based TV project. She is looking for a full-time job in Washington, DC, or Europe. Congratulations to Sarah Peacock (BS Bio Anth 2009), who will be attending the Master's Program in Forensic Anthropology at Boston University. She says: "Thank you for everything you did to help me get here; I couldn't have done it without you guys!" Abigail Greenleaf (BS Public Health 2007), awarded a Cotlow Research Grant in 2006 for her project "The Journey of a Culture: The Sudanese Immigrant Community in Iowa City, Iowa," is in Cameroon as a health extension worker with the Peace Corps. "I am really enjoying my time here in Cameroon. It is an anthropological heaven! I am living in a compound with a muslim family. There are three wives and over thirty kids so someone is always explaining something to me. The wives are great and are always inviting me to go to naming ceremonies, funerals, etc. I am learning Fulfulde, the local language and hopefully will be able to speak really well by the end of my two years." Lissa Cruzado (MA Anth 2007) is working with the DC organization El Hogar de Mi Hermana (My Sister's Home) to help shelter and educate women who have been victims of domestic violence as well as social, economic, physical, and sexual abuse. Alumna Debra A. Prince (MA Anth 1999) is working as Assistant Professor in the Department of Anatomy and Neurobiology at the Boston University School of Medicine. According to the School of Medicine's Website, Prince "will be teaching courses in forensic anthropology and journal club studies. Dr. Prince joins the Forensic Anthropology program after serving as a forensic anthropologist at the Joint/POW MIA Accounting Command’s Central Identification Laboratory in Hawaii for the past four and a half years." Debra is a member of The American Academy of Forensic Sciences: Physical Anthropology Section, the Society of Forensic Anthropologists, the International Association for Identification, and the American Association of Physical Anthropologists. Her research interests include age changes in the human skeleton, skeletal biology, bone trauma, soft tissue decomposition, bioarchaeology, paleodemography, and dental anthropology." "We're holding an intimate family wedding ceremony followed by brunch in MD and then an evening cocktail reception for friends. Unfortunately we never got around to making a website or I would definitely share. We've decided to spend a few days in the Shenandoah - not exactly sure where since we're going with my brother & his wife and they've organized everything!" Congratulations to Shelly Habecker, who co-taught Development and Diaspora among other courses with Steve Lubkemann in 2008-09. 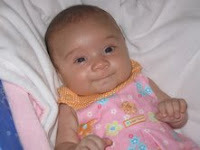 She and her husband, David, welcomed Lucy Claire Habecker into the family on April 27, 2009. Lucy was born 7lb. 13 oz., 19.5 inches. "She looks just like her dad and is getting cuter by the day. Next week she'll take her first transantlantic flight to the UK to attend my PhD graduation ceremony at Oxford University." As part of a series of lectures entitled "Science and Sandwiches" Professor Grinker gave a July 29 lecture on the science of autism as a cultural system. "emphasized the importance of culture in understanding how societies view illnesses, and discussed how in a variety of different historical contexts, radical shifts in how illnesses are identified, treated, and counted resulted not from new scientific discoveries but from cultural changes. Grinker then noted that a number of factors produced the global rise in autism awareness, with some being more salient than others depending upon cultural context. "Despite the increase in awareness, Grinker noted that there is little scientific knowledge about ASD outside of North America and Western Europe. Indeed, there are insufficient data to estimate the prevalence of autism in the Caribbean, Central and South America, Eastern Europe, the Middle East, South and Southeast Asia, and the entire continent of Africa. Although, he said, most researchers expect that the onset and core symptoms of ASD are consistent across cultures, this remains an assumption. He stated that ASD experts to date know little about how genetic heterogeneity and cultural differences interact to influence the kind and range of impairments that are associated with ASD, its prevalence, course, or familial patterns. He concluded by praising advocates – including his own autistic daughter – for showing that autism can be reconfigured as possibility rather than limitation." Trinh Tran (BA IAFF 2006) recently returned from Vietnam where she worked to help poor young women learn to be professional cooks. "Vietnam was the best experience of my life in many ways it was a homecoming and a chance to connect with my culture and faith. I feel very blessed for the opportunity. I have decided to attend Hofstra Law School in the fall. I am happy about this new journey and am excited to get back to school again. I will put forth my best effort and seek opportunities that allow me to advocate for the poor. That's all that really matters right? Plus I am excited to be close to NYC where many opportunities are available." Congratulations to Susan Bishai (MA Anth 2008) on her internship at Amnesty International's Refugee and Migrant Rights Program. This fall, Susan, who attends GW's law school, will also be working as a student attorney in their Immigration Clinic.
" I miss the Anthropology department at GW quite a bit, and fondly reminisce about it with the fellow anthro students with whom I'm still in touch. The program of study (especially the development track) has come in handy many times in relation to law school (human rights; cultural property; etc) and many other aspects of my life. [Barbara Miller's] courses in particular (especially the 'Risk' course) were amongst my favorite. Of course, I've always maintained that anthropology is the THE most relevant and wide-ranging academic discipline!" Alene Kennedy Hendricks (BA 2006) in Georgia with the Peace Corps. Alene Kennedy Hendricks (BA Anth 2006), and her husband Peter are in Georgia with the Peace Corps. She reports: "We're almost finished with pre-service training and will be sworn in as volunteers next Friday. Our permanent site is New Rustavi, a Soviet-era city in the south of Georgia near the Azerbaijan border. Despite being pretty unappealing visually, I think it'll be an interesting place to work and live the next two years. Our host family's neighborhood (soon-to-be our neighborhood! ), contains a mix of Russians, Azeris, Armenians, Turks, Abhkazian IDPs and, of course, Georgians. [Speaking of medical anthropology...] We've already had some exposure to Georgians' attitudes to illness as both Peter and I have been sick multiple times. Our host grandmother attributed the first stomach ailment I experienced to the cold bucket bath I had taken earlier in the morning. And the cause of Peter's fever was the fact that we left the windows open the night before. I'm anxious to learn more Georgian so I can get a better handle on these concepts." Peter and I with our host family relatives, Mamuka and Salome. We wish Alene the best of luck in Georgia!